5th Annual KXSC FEST! Featuring Dan Deacon, Chelsea Wolfe, NGUZUNGUZU + more! If you are looking for 2015's KXSC Fest, click here! This year, KXSC Fest is moving indoors to the Campus Center Grand Ballroom so we can get a little more intimate and let those of you who are 21+ get your drink on in Traddies. If you'd like to help us get the funds we need to move Fest back outside next year, please support us during our April Fundraiser! Combining attention deficit rhythms with an interactive live experience, Dan Deacon's work brings to life the wildest Geocities website you could ever muster from archive.org. Deacon's past two albums tackle serious political issues and he successfully balances this Web 1.0, cyberpunk youthfulness with a symphonic concern for his times. Standing at the intersection of goth, folk, and metal, Chelsea Wolfe creates melodies so haunting you might start to wonder what black magic Wolfe must have conjured up to create her albums. 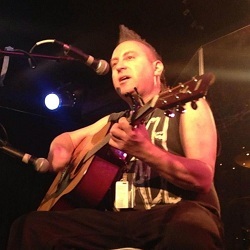 Barry is a die-hard KXSCer and long-time Punk Rocker who sings and plays songs on an acoustic guitar. Some songs are serious, others are wildly NOT. All in all, he believes in putting on an entertaining show. 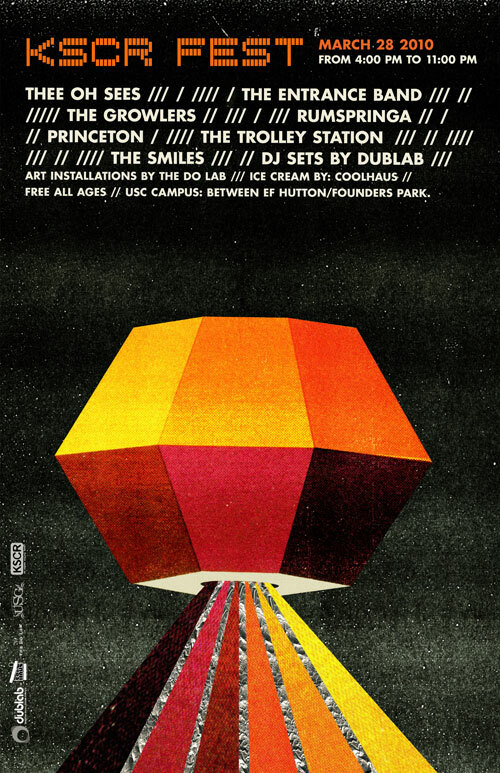 dublab is a non-profit web radio collective devoted to the growth of positive music, arts and culture & sharing beautiful music via the world's best djs. 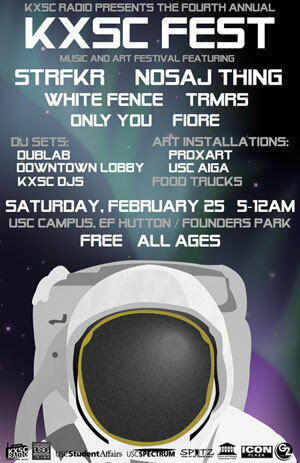 Due to recent changes in campus access policy by the USC administration, KXSC Fest 2013 is only open to USC students, faculty and staff. A USC ID will be required for entry to the Campus Center Grand Ballroom, although ID is not necessary for access to the outside food trucks and art vendors (regular campus access rules still apply). Each USC student may bring ONE non-USC guest with a valid ID, who must accompany them to the entrance of the ballroom. All of us at KXSC appreciate the community support we've received over the past four years. You love Fest and we love you!! We are truly sorry that Fest is a closed event this year and we encourage all those who are interested in attending to seek out their USC friends and family. If you would like Fest to return to an open, community event, please fill out our survey here.